This was a cool session. I was able to see Prabhu Barathi and Mike Fortuna (sorry, no twitter, please remind him about that) again after seeing them in the last VMUG and meet other VMware administrators who were eager to learn about NSX. I also got to meet Julie Starr, who is a firewall specialist inside the NSX team (I put some of her blog posts here). The dynamics consisted of VMware employees giving you a more technical presentation than you would get at a VMUG, with people testing out the homelabs, and basically answering every question that came up. This is actually very important, because the people that showed up (over 100 signed up, we had three simultaneous classes on this date) have different backgrounds: from CCIE or firewall specialists with no VMware experience, to students that are just learning about VMware. The work of teaching and explaining about NSX is quite difficult since it encompasses so many skills until you get the "aha" moment. 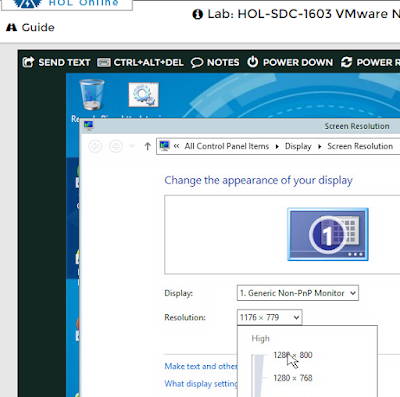 The website that features the Hands On Labs is web.hol.vmware.com/socialabs . You can create an account and possibly also have these HOLs count for cloudcredibility.com (this is a great list of all the NSX tasks https://www.cloudcredibility.com/nsx/tasks/list ). 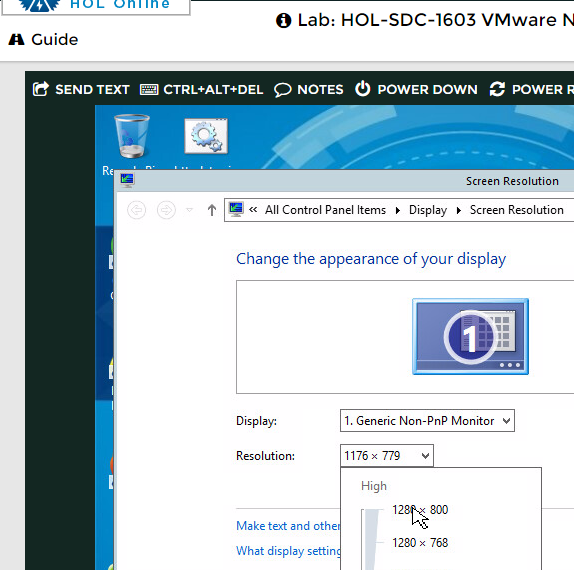 1) Increase the Hands on Labs VM resolution. By default it's not set to the maximum! Hola amigos de Latinoamérica! Fue un honor participar en las sesiones de comunidad de este evento. Fue muy divertido ponernos de acuerdo entre todos para asegurarnos q esta oportunidad de presentar en un evento global de VMUG en espanol! NYC VMUG April 2016 presentation "How I would explain NSX to a friend in 10 minutes"
I did a small presentation on "How I would explain NSX to a friend in 10 minutes" because I found out that explaining NSX to a fellow VMware administrator was not something that could be done in a few sentences. I would add a bit more today - for example, I'd like to add the convenience of having the VM's networks defined virtually and not needing to trunk a new vlan into the hosts whenever you need to create a new subnet. 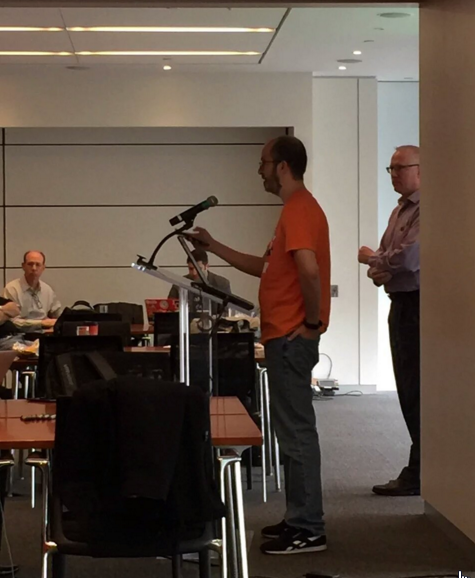 It was a great "tee up" to VMware's @prabhu_b and Michael Fortuna who gave an excellent (and more in depth) session . The full ppt is available here and hopefully I will get a video of it soon.